While the Justice and Development Party swept back, now able to form a single-party government, the Nationalist Movement Party (MHP) lost half of its seats. The Peoples' Democratic Party (HDP), on the other hand, experiencing a tumultuous vote count, squeaked above the 10 percent national election threshold. The Republican People's Party (CHP) is also among those that failed. Labeled "Mr. No" after the June 7 elections for rejecting every single offer made during coalition talks and cooperation meetings, Nationalist Movement Party (MHP) Chairman Devlet Bahçeli was punished for his intransigence in the Nov. 1 elections as his party received 5 percent less of the national vote in yesterday's elections than they did in June. Bahçeli faced a great opportunity after the June 7 elections as the prospect of forming a coalition government, either with the Justice and Development Party (AK Party) or the Republican People's Party (CHP) and Peoples' Democratic Party (HDP) bloc, offered him the chance of achieving power. But he chose to rule out all possibilities on the night of June 7. The MHP chairman was even offered the prime minister position in the coalition government proposed by CHP Chairman Kılıçdaroğlu. Bahçeli turned down the offer on the grounds that he could not side with the HDP, due to the will of his constituency. After coalition talks between the AK Party and the CHP failed, Bahçeli also opted to stop his party becoming a part of the caretaker government. Tuğrul Türkeş, son of MHP founder Alparslan Türkeş, did what democracy required, and accepted the offer. As Türkeş became a deputy prime minister, he was referred to the MHP's discipline committee and expelled from the party. Amid such compromises, Bahçeli remained the Mr. No of Turkey. However, the most striking "no" was yet to come. After the deadliest terror attack in the history of Turkey, Bahçeli rejected the invitation by interim Prime Minister and AK Party Chairman Ahmet Davutoğlu to a meeting for coalition talks. This last "no" badly damaged Bahçeli's popularity. The MHP won 16.3 percent of the vote in the June 7 elections and had 80 seats secured in Parliament, while the historic failure yesterday saw the party lose 5 percent of the national vote and finish with 11.9 percent. Bahçeli's party also lost half of its seats in Parliament over the course of five months. Of all the parties, the MHP now has the fewest seats in Parliament. Bahçeli's defeat does not surprise anyone familiar his political record, since he has lost more than 15 elections over the course of his career. Rumors now abound whether he will resign after such a historic defeat, as it seems Turkey has finally rejected Mr. No. Having stunned the country by securing 80 seats with more than 13 percent of the vote in the June 7 elections, the pro-Kurdish Peoples' Democratic Party (HDP) barely passed the 10 percent national election threshold on Nov. 1, losing 21 seats in Parliament. The HDP presented itself before the June 7 elections as a party advocating peace. HDP co-chairs Selahattin Demirtaş and Figen Yüksekdağ addressed the Kurdish issue, and occasionally pledged to make the PKK disarm and bring peace to the region. Demirtaş stood in opposition to President Recep Tayyip Erdoğan as the June 7 elections neared, and achieved to get the backing of various groups on an eventful journey taking his party to Parliament. "We will not make you the president" was the motto of the HDP and their supporters. Kurds in eastern and southeastern provinces, along with many from the west, voted for the HDP on June 7. On the election night, Demirtaş acknowledged that his party received many custodial votes and promised they would act accordingly. Following the June 7 elections, the HDP had the chance to increase its votes by distancing itself from the PKK. The party and its deputies, however, increasingly sided with the PKK. HDP deputies made continuous remarks that some interpreted as romanticizing the terrorists. Yüksekdağ's remark in particular drew harsh criticism. "We lean our back on the YPJ, YPG and PYD and we do not see any harm in mentioning and defending it," Yüksekdağ said, voicing support for a PKK-affiliated group. In late July, HDP Deputy Abdullah Zeydan, threatened Turkey and said the PKK has the power to "drown Turkey in its spit." Over the course of the last five months, Demirtaş, initially claiming to be the co-chair of the only party in Turkey that could make the PKK disarm, later contradicted himself by changing tack after the elections. In addition to this, HDP deputies were caught delivering aid to the PKK and rushing wounded terrorists to hospitals. Demirtaş's mini party rally at the scene of the deadly Ankara twin suicide bombings, where he called on the people to vote for his party and punish Erdoğan, was the final straw for some. He repeatedly labeled the Turkish state and Erdoğan as murderers and attempted to put the blame on third parties only hours after the incident. 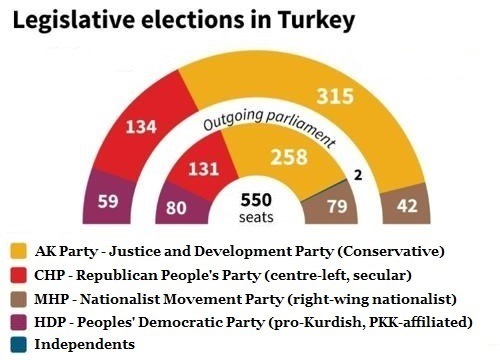 In the Nov. 1 elections, the HDP received 10.8 percent of the vote and 59 seats in Parliament. The outcome comes as a set back after the June 7 result. Losing close to 1 million votes, especially from Kurdish voters, Yüksekdağ called the outcome a success and blamed terror incidents for the lost seats. Despite the HDP's satisfaction, some interpret it as the first warning and, perhaps, a last chance for the party. Having been content with the outcome of 24.95 percent of the vote in the June 7 elections, Republican People's Party (CHP) Chairman Kemal Kılıçdaroğlu late Sunday once again rejected to resign following a 0.36 percent rise in votes for his party, seeing the Justice and Development Party (AK Party) get 4 million more votes in the five months since the June 7 elections. The question is if the CHP is successful or not. In the run-up to the June 7 elections, the main motive of many parties was to wage a political war against the AK Party and President Recep Tayyip Erdoğan. The slogan: "We will not make you president," gained much popularity. The aim was to push the Peoples' Democratic Party (HDP) over 10 percent and in to Parliament. Having achieved that, CHP voters and party members were happy with the June 7 results after the AK Party failed to receive enough votes to form a single-party government. On top of that, CHP Vice Chairman Murat Özçelik revealed that he and his family had voted for the HDP in the June 7 elections. As coalition talks started, the CHP sat at the table with the AK Party and put forth the two unchangeable conditions that foreign policy and education policy must be rewritten from scratch, demanding the AK Party abandon its policies on education and foreign affairs. The CHP had been expected to increase its votes in the June 7 elections due to its arguably successful pledges to youth and retirees. The outcome, however, was 5 percent lower than Kılıçdaroğlu had anticipated. Going into the Nov. 1 elections, the CHP called on its voters to vote for the CHP, trying to reclaim custodial votes that went into HDP's direction. The CHP went on to address youth and retiree issues. The outcome was the CHP increasing its votes 0.36 percent. Kılıçdaroğlu seems to be following in his predecessor Deniz Baykal's footsteps. Even though a new face brought new expectations, some CHP voters now question Kılıçdaroğlu's future after the most recent failure, struggling to pass 25 percent. The party is sure to sit down and criticize itself, search for reasons for why the party has failed to make significant gains against the AK Party since 2002 in every election. Whether or not such self-criticism changes the party in any meaningful way will be seen in the near future.